Our 1 month holiday in Germany is slowly coming to an end. We have been here for 4 weeks, and have another few days to go. Every year, after being away for 3-4 weeks we crave our comfort zones at home, less excitement, no more family members to visit, and especially for me, no more heavy foods and cakes to eat on a daily basis. My body screams for veggies. Don't get me wrong: I like German homemade food. In the end of the day, I cannot deny my German roots and the foods that I grew up on. But as I get older I cannot stomach them anymore. It's been too many breads, potatoes, gravy and meats. So far I have been trying to keep control over the heavy foods by portion control. However, I can feel my system struggling with digestion. The foods seem to slow me down and make me tired. Time to go home. Today's recipe is two recipes in one post. The lentil pilaf is a meal in itself: wholesome and filling, full of spices and flavor, yet vegan, gluten-free and rich in proteins. 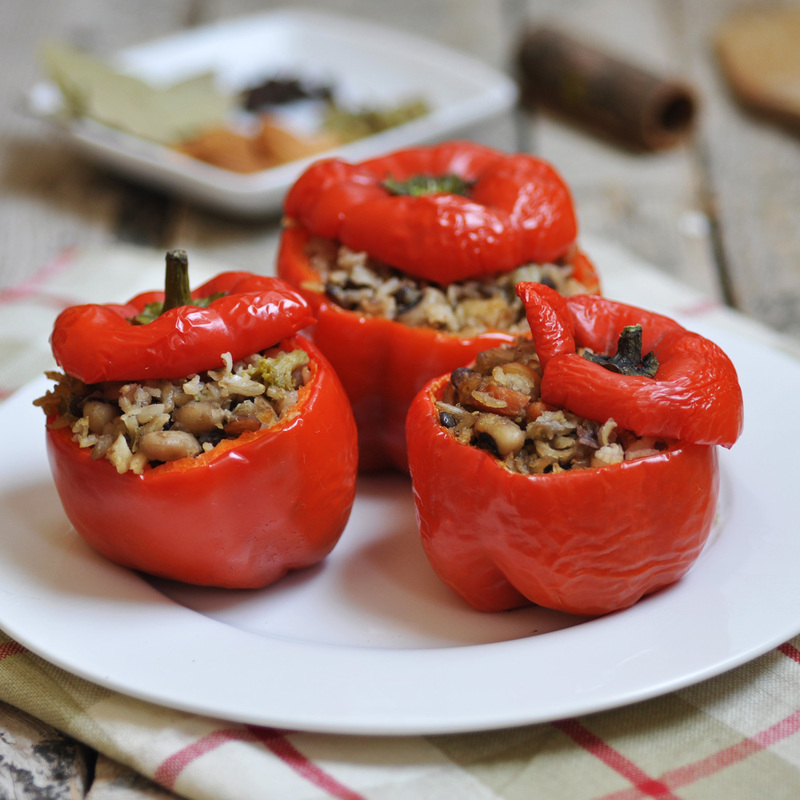 Any leftovers are good to eat in stuffed peppers. Stuffed peppers are one of my favorite way of using up leftovers. It's easy, doesn't need a lot of attention and the freshly roasted peppers add some extra fruity freshness and lightness to a dish. This is exactly what I crave now. Can't wait! Prepare the peppers by cutting off the tops and de-seeding the insides of the peppers. Fill each pepper with the pilaf, and replace the tops. Place the filled peppers in a roasting dish. Roast for 30 to 45 minutes, until peppers are softened but still firm. Serve warm.